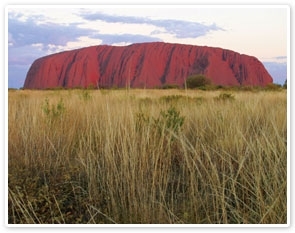 Today you’ll be up early to drive to Talinguru Nyakunytjaku – the Uluru sunrise viewing area. During the journey your experienced Driver Guide will share some history on the numerous sacred sites that you’ll pass along the way. These stories form part of what is known to the local Anangu people as Tjukurpa – the foundation of Anangu life and culture. Tjukurpa encompasses Anangu religion, law and moral systems, the creation period and the relationship between people, plants, animals and the land. Once at Talinguru Nyakunytjaku you’ll be served a morning tea of coffee, tea, hot chocolate and an assortment of sweet biscuits while you begin to familiarise yourself with the beautiful surroundings. You can just relax and take a seat or wander around the viewing area in search of your own personal place to watch the sunrise. Simply translated, ‘Talinguru Nyakunytjaku’ means ‘to look from the sand dunes’ and this area of Uluru – Kata Tjuta National Park lets you do just that. You’ll be captivated by the view from the dunes as the sun rises over Uluru in the foreground and Kata Tjuta in the distance. The Talinguru Nyakunytjaku viewing platform allows you to see for many kilometres. From here you’ll witness first light as it gently embraces the desert landscape. You’ll no doubt want to take advantage of the amazing photo opportunities that this experience provides. As the sun rises so too does the incredible birdlife that calls Uluru home. Listen as the birdsong welcomes the new day and experience the tranquillity of nature. You’ll want to take advantage of the amazing photo opportunities that this experience provides. As the sun rises, so too does the incredible birdlife that calls Uluru home. Listen as the birdsong welcomes the new day and experience the tranquillity of nature.